Copenhagen and Stockholm are two singular cities — for starters, being capitals of Denmark and Sweden, with Copenhagen arguably more European than Scandinavian by nature. But a recent visit proved that they have more in common than one would suppose: both are linked by an almost-religious devotion to design, cutting-edge hotels and restaurants, royal families (yes, they're related) — and the fact that "green" not only means "go," but also describes a vibrant and enviable contemporary lifestyle. Here's a brief update of what's new, what endures — and a couple of caveats. This week, Copenhagen. We'll start with the caveat first. When crossing the street, don't just look for cars. 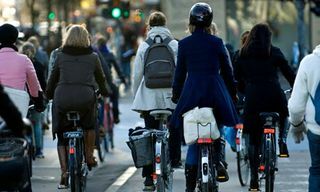 They may be the "happiest people on earth," but with 55% of the population commuting via bicycle, Copenhagen's chicly-dressed cyclists take right of way seriously. That said, this city of fairytales (Hans Christian Andersen), copper steeples and tradition always has news to share — and enjoy. 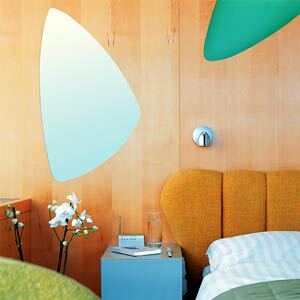 Arne Jacobsen design at SAS Royal Hotel, Copenhagen. To begin, take two centrally-located hotels, representing different generations of design savvy. The SAS Royal Hotel, the world's first designer hostelry, opened in 1960 and heralded the arrival of modernist Danish Jet Age design, thanks to architect Arne Jacobsen. Jacobsen's designs — from building to chairs to cutlery (his flatware was featured in Stanley Kubrick's "2001: A Space Odyssey" and is still sold) — endure as icons of Mid-Century design. A refurbishment of the hotel's rooms has kept the cosmopolitan Jacobsen spirit as fresh and modern as ever. My room was an oasis of tile, blonde wood, light and comfort. I still pine for it. 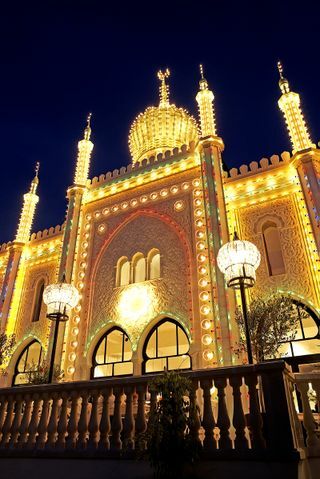 The Moorish Palace in Tivoli that is home to Hotel Nimb in Copenhagen. The new kid on the block is the boutique Hotel Nimb, recently opened with 13 individually designed rooms with fireplaces and antiques overlooking the beloved Tivoli Gardens. 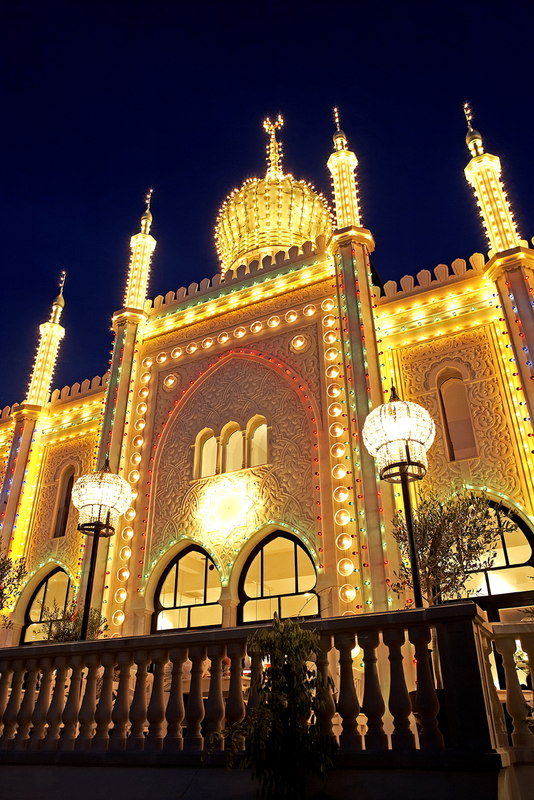 Actually, the hotel is IN Tivoli, in the extravagant Moorish Palace building dating from 1852. But inside all is cutting-edge 21st Century chic, and the bar is the buzziest in town. There's a one-star Michelin gastronomic restaurant as well as a Brasserie which draws upscale locals. For the best scene, the new hot nabe is Vesterbro, Copenhagen's version of NYC's Meatpacking District. Formerly the territory of butchers, fish processors and, ahem, ladies of the evening, this industrial area has been transformed with bars, lounges and art galleries (think London's Smithfield with fins). The most exciting gastronomic entry here is Fiskebaren, a contemporary space where the chef packs 'em in with innovative (read: not heavy) interpretations of classic Danish dishes, made from the freshest seafood with a menu that changes daily. I've had a lifelong love affair with Copenhagen and, while there is always something new, sometimes only a lunch visit to an old friend will do. Schonnemann's Restaurant, located downstairs on a quiet square, has been a city favorite since 1877. 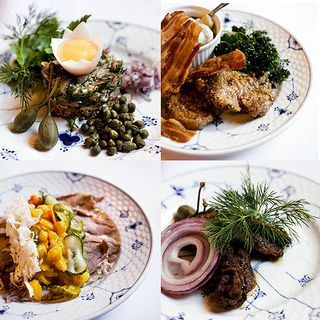 The draw here – aside from the crowd of Danish celebrities, movers and shakers in the cozy old dining rooms with sand on the floor — is the astounding variety of smorrebrod. Each of these organic open-faced sandwiches is a meal in itself, best accompanied by one of the many local and imported beers on offer. If you're into herring, this is your joint. If, like me, you're not, it's still Danish traditional food paradise, where the shrimp are the freshest, the massive seared "tartare" is the best I've ever had, and the atmosphere is decidedly "heygge." This unpronounceable word, meaning welcoming coziness, is the city's signature. Snug in Schonnemann's, I may not be Danish by background, but feel very much at home. a recipient of the Lowell Thomas Travel Journalism Award for Consumer Reporting. of the seven seas to date… and counting.